You know, I wish people would really think long and hard about what it feels like to be imitated without wanting to be. It is normal that we seek out people whom we'd like to be like. But it is also important that we remember that everyone is an individual. I have been copied time and time and time again and I can't stress to all of you how absolutely UNFLATTERING it is. Instead of feeling inspired, people have directly ripped off my designs and then acted as if they were the clever ones. The wonderful artist Amna Al Fardh just informed me that the Spring lady portrait that I created was not only copied, but then the person was thanking people for their compliments of "her work". SERIOUSLY?! If only she had contacted me and asked and then given proper credit for the idea, this wouldn't even be an issue. Once again, I am truly disheartened at the lack of integrity that exists in the so-called "creative" quilling community. 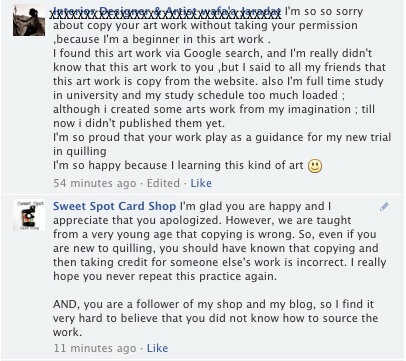 If the sole purpose of you visiting my blog or shop is to copy my designs, I BEG you, please don't bother to follow me. I am not the only person who feels this way. A true artist knows how many hours and feelings and emotions are involved in creating original content. I have read countless blog posts on the same subject matter. It is NOT flattering at ALL! It is intrusive and disrespectful and disheartening. Copying an artist does not make you an artist, It makes you a copycat! As the picture shows, this isn't me overreacting. Mine is the one on top. This person purposefully and willingly sat down and completely copied my design and then proceeded to call herself an artist and take credit for the work. Instead of creating something out of her own imagination and truly being inspiring, she chose to take the easy route and just sit back and do what's been done. To my fellow quillers; do you not appreciate when other quillers share tutorials and techniques? Do you not appreciate when works are shared for inspiration? If this practice continues, no one will EVER want to share their work or ideas or techniques because they'll be too worried that someone else will then lay claim to their ideas. And, to be honest, I think I have had my fill of copycats. At this point, I regret ever sharing anything! As Amna put it, "I honestly feel bad for you Sandy because your designs are the most copied over the net from what I observed the past few years." Perhaps someone else may be flattered by that fact, but I am not and I have never invited that kind of attention. I have always had my copyrights clearly on my blog and, I now have watermarks on all of my pictures. This is completely unacceptable. UPDATE: This is what the person claimed, followed by my response. Please note that there was absolutely no mention of her copying it from anywhere AND she is one of my followers, she could easily have sourced it! So, I'm not buying her story. :( I always do my best to give credit to the person I take inspiration from, obviously it isn't always possible if the chain of credit isn't there but when it is flat out copying with no credit then that's a huge sad face. I love your autumn lady by the way! I'm so sorry this happened to you, AGAIN, Sandy! Please don't quit sharing your unique work, even if you must stamp all over it. I wish I had an answer. Thanks, Molly. But it seems that no amount of stamping can stop these people. They all claim to "not know" it was wrong to copy. Or that they "didn't know" where the picture came from. Yet they manage to replicate things almost exactly. I don't know what else to do! De verdad que me tiene sumamente desanimada. Ni ganas tengo de seguir compartiendo mis trabajos. You get the SWEETEST comment award! Thanks for your words. This is no different than being bullied at school. I feel for you. I know it's not good to comment negatively but maybe you should post the copycat url and then all your fans can post a comment on that site-not negative, just stating their knowledge of the original. I would be glad to. That's a good comparison. That is pretty much how it feels. I appreciate your willingness to support me but, I feel that if I bashed them publicly then I'd be just as bad as they are. I know how you must feel Sandy. It isn't flattering at all to see your creations copied. It is even worse when you see the copy cat accepting all the compliments without any self respect shamefully, pretending to be the inventor or original creator. They may get it from the web, but how many times would they have to go to the link to create it, and could anyone believe that they would not have noticed who created it? 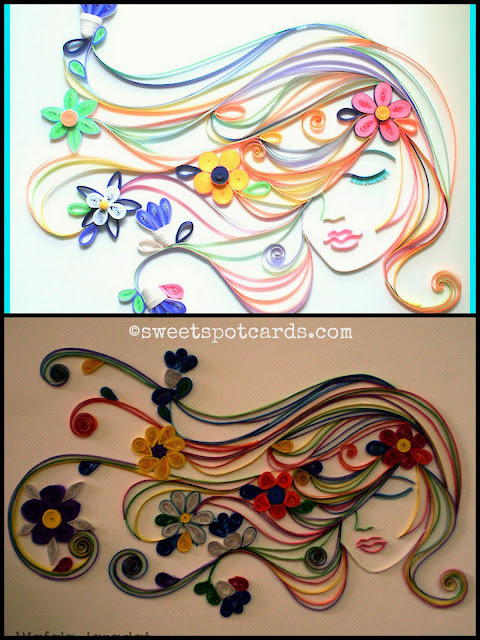 The first thing I do, when I see a beautiful quilling is to find the artist. Always be respectful of everyone's individuality and hardwork. Ugh! I'm sad to see this happen to you. I have seen copies before ...this is the first I have seen of yours, however I noticed work being copied from other quillers. Its common sense ..we don't intentionally copy someone else's pride and joy. That's something I learned in kindergarten. It's very hurtful and it needs to stop! I love your work! ! The internet can help and hurt us at the same time.